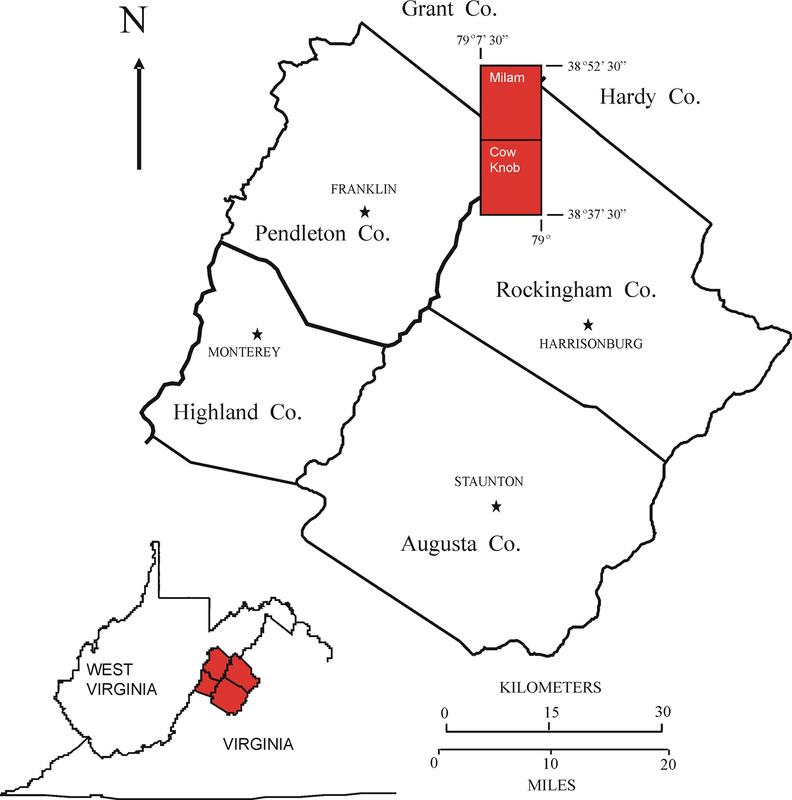 Reconnaissance bedrock mapping and geochemical sampling were carried out on the Milam and Cow Knob, West Virginia-Virginia quadrangles (see location map above) from May 2006 through July 2007 by investigators Ronald McDowell, Katharine Lee Avary, Eric Lewis, James Britton, and Paula Hunt (WVGES). A retired K-12 teacher, Paula Waggy (Franklin, WV) and an undergraduate student, Megan Ganak (Concord University, Athens, WV) worked as geological field assistants for part of the field season. Funding for their salaries and field expenses was provided by the West Virginia Geological and Economic Survey. 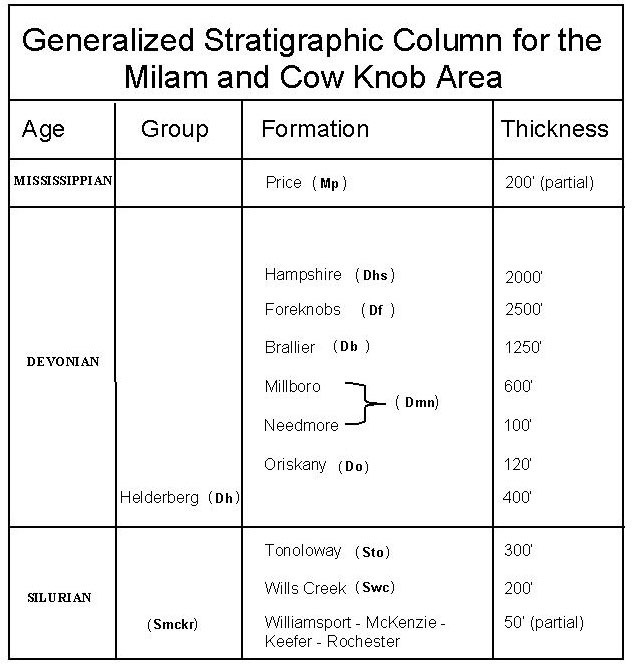 Rock units in the Milam and Cow Knob area range in age from Silurian through Mississippian. Shown above is a chart of the stratigraphic units encountered in the mapping area. The Milam and Cow Knob quadrangles, located in the Valley and Ridge physiographic province (see figure above modified from Kulander and Dean, 1978), lie within a very complex deformational regime. This deformation takes the form of folding that increases in intensity to the north and west. Strikes, fold axes, and fault traces generally trend northeast-southwest. Construction of cross-sections on the Milam Quadrangle suggests intense folding in the northwest corner of the map was probably initiated by or at least associated with thrust faulting deeply rooted in Silurian or Ordovician shales present in the subsurface. Deformation propagated readily through overlying units resulting in west-vergent compressional folding of the strata of the area. The Silurian-Devonian Helderberg Group carbonates and Devonian Oriskany Sandstone are the dominant ridge formers in the western half of the Milam Quadrangle but in the eastern half, resistant sandstones of the Foreknobs Formation form ridge crests. On the Cow Knob Quadrangle, ridge forming units are either the Devonian Hampshire Formation or the Mississippian Price Formation. Strata of the Devonian Hampshire Formation dominate the exposed bedrock on the Cow Knob Quadrangle. Below left, WVGES geologist Eric Lewis examines a typical outcrop of Hampshire sandstone with thin, tabular cross-bedding, Rough Run Road, ~1 mile east of the crest of Shenandoah Mountain. Below right, epsilon cross-bedding filling a shallow channel in the Hampshire, Shenandoah Mountain, east of Criders, VA. This type of cross-bedding is associated with bedforms that migrate laterally across stream channels rather than directly downstream and is commonly found filling old stream channels. Above left, an additional example of cross-bedding filling a shallow channel in the Hampshire, Shenandoah Mountain, east of Criders, VA. Above right, spheroidal weathering in a Hampshire mudstone unit, Shenandoah Mountain, east of Criders, VA. This type of weathering is typical of rocks that lack well defined layering or stratification. The most fossiliferous stratigraphic unit found in the Milam and Cow Knob area is the Devonian Foreknobs Formation. In fact, the presence of numerous, diverse, marine fossils in a rock unit dominated by interbedded sandstone, siltstone, and shale helps confirm the identity of the unit. Below left, well preserved crinoid column segments in the Foreknobs, Camp Run Road ~1 mile east of Sweedlin Valley. Below right, an extremely fossiliferous Foreknobs sample dominated by Styliolina sp., the elongated, cone-shaped fossils, Peru Hollow Road ~1 mile east of Peru, WV. Notice that all the Styliolina in this sample have been oriented in the same direction by current. Current flowed from left to right with the pointed end of the fossils oriented into the current. The coin is 3 cm in diameter. Because access to the northern half of the Milam Quadrangle was difficult or impossible given the time constraints of the summer mapping season, it was necessary to examine similar strata on adjacent and more accessible map areas. Dumpling Run Road on the Petersburg East Quadrangle provided such an area. Strata along Dumpling Run are oriented strike-parallel (northeast-southwest), and a traverse along this road encountered the same formations exposed on the Milam Quadrangle immediately to the south. Consequently, structural measurements and rock descriptions taken on Petersburg East could be projected back onto the Milam map. Below left, WVGES Geologist Eric Lewis stands next to an exposure of intensely deformed, Devonian Millboro Shale in a quarry near the east end of Dumpling Run Road on the Petersburg East Quadrangle. Below right, secondary mineralization of the Millboro in a quarry exposure ~1 mile south of Brake, WV on Sweedlin Valley Road. The orange mineral is limonite (hydrous iron oxide - FeO(OH)·nH2O); the pale whitish yellow mineral is native sulfur. Both of these minerals formed as pyrite (iron sulfide - FeS2) weathered when exposed to air. This deposit of sulfur is know as an effluorescence or bloom and is a common sight around spoils piles from metal-sulfide mines in the West. Above, an algal stromatolite layer in the Silurian Tonoloway Formation that has been disturbed by an intense storm, probably a hurricane, and then recemented back together. An occurrence like this is a major clue in deciphering the paleoclimate of this part of North America in the Silurian. East flank of South Fork Mountain, Dumpling Run Road on the Petersburg East Quadrangle. 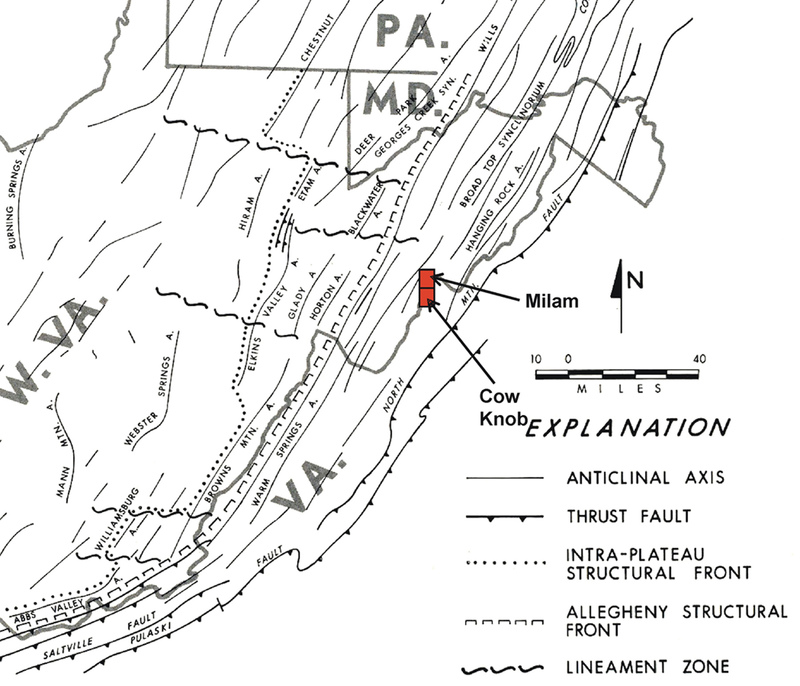 Unlike adjacent quadrangles to the west and south, no igneous intrusives were encountered on either Milam or Cow Knob. A total of 52 bedrock samples were collected for geochemical analysis during the field season. These analytical results have been combined with results from past year's STATEMAP projects in a geochemical database available to the general public as West Virginia Geological Survey Report of Investigations RI-34 (McDowell, 2001). Concurrent with this year's STATEMAP project, the geochemical database has been brought up to date and summary statistics fully revised. A GIS-compatible version of the database is currently available. Below left, geological assistant Megan Ganak points to deformation and an unusual claystone layer in the Devonian Shriver Chert in a small quarry in the extreme northwest corner of the Milam Quadrangle, south of Petersburg, WV. Below right, closeup of the claystone layer. This material is of interest because geochemical analyses shows that it contains significantly higher levels of rare-earth metals than other sedimentary rocks in this portion of West Virginia, possibly indicating the presence of volcanic ash within this stratigraphic interval. 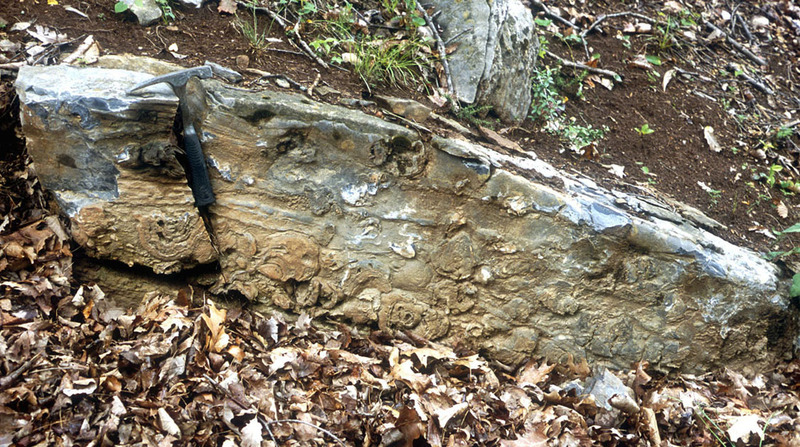 While other ash layers have been reported within the Devonian of West Virginia (for example, the Tioga Bentonite), no one has previously suggested that such a unit might occur near the contact between the Devonian Helderberg Limestone (Shriver Chert Member) and the overlying Devonian Oriskany Sandstone. Dean, S., Kulander, B., McColloch, G., McColloch, J., Sites, R., and Kulander, C., 2002, Bedrock geology of the Petersburg East Quadrangle, Hardy County, West Virginia: West Virginia Geological and Economic Survey, Open File Map OF-0203. Kulander, B. and Dean, S., 1978, Gravity, Magnetics, and Structure: Allegheny Plateau/Western Valley and Ridge in West Virginia and Adjacent States: West Virginia Geological and Economic Survey Report of Investigations RI-27, 91 p.
McDowell, R., compiler, 2001, Stratigraphic Geochemical Database for Portions of Pendleton, County, West Virginia and Adjacent Virginia Counties, covering portions of Pendleton Co., WV, Highland Co. VA, and Augusta Co., VA: West Virginia Geological and Economic Survey, Report of Investigations No. 34, computer diskette.